A mishmash of foodie writers dispute, humorously or more self-seriously, the pros and cons of cooking and dining alone. While eating by oneself can be the busy worker's greatest pleasure, as Colin Harrison notes of his solitary Manhattan lunches during a work day ("Out to Lunch"), and mother Holly Hughes ("Luxury") agrees is a secret but too rare pleasure, other writers see it as depressing or shameful. In "The Lonely Palate," Laura Calder quotes Epicurus as saying, "we should look for someone to eat and drink with before looking for something to eat and drink" then offers a recipe for Kippers Mash. 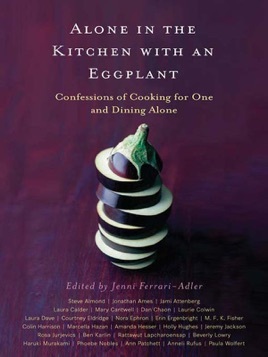 Eating is an act of love, thus prompting Jonathan Ames ("Poisonous Eggs") to dine out and flirt with the waitress. "Table for One" by Erin Ergenbright records how the single diner is perceived uneasily by the wait staff. And M.F.K. Fisher relishes solitary dining ("A Is for Dining Alone") as a way to escape "the curious disbelieving impertinence of the people in restaurants." The collection is named after an essay by Laurie Colwin, who found a dozen different ways to cook eggplant on her two-burner hot plate while living alone in a tiny Greenwich Village flat.